I have noted before the Roman portrait of Marcus Aurelius stolen from a museum in Algeria. 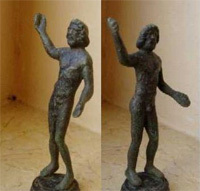 A report notes the seizure of antiquities, including a bronze statue, in Algeria (M. Abi, "Des statuettes antiques récupérées par la gendarmerie", Le Temps d'Algérie October 2, 2010). It is also noted that in January 2007 some 250 antiquities were seized at Aguenar Airport (in southern Algeria); 3200 were recovered in 2006.